Property Size 2,351 sq. 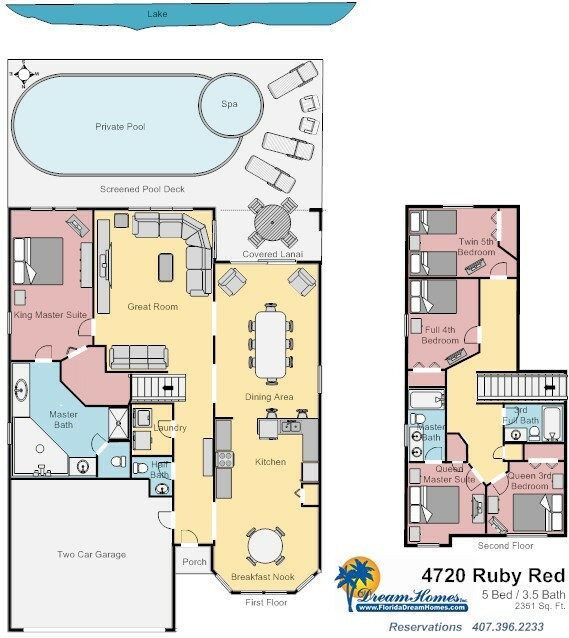 ft.
With flat screen TVs in every bedroom, an expansive living room, large dining area, separate breakfast nook, outdoor table under the shaded lanai and a large pool and pool deck there's more than enough room for everyone in the family to enjoy your vacation time together. The large kitchen is fully equipped. The adjoining formal dining area has a table and chairs for eight while the two kitchen bar stools and the breakfast nook table with seating for four means there are enough chairs for the entire family to enjoy a meal together. 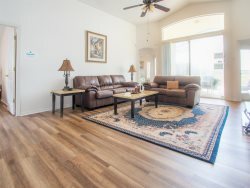 When you consider all the money you will save on baggage fees by having your own full size washer and dryer as well as the money saved when the fully equipped kitchen means you don't have to eat all three meals at a restaurant, it's even harder to believe that you got all this home at such an incredible price. This is one vacation your family will be talking about for a long, long time. 5 Bedrooms/3.5 Bathrooms Home with Private Screened Pool, Hot Tub, Lake View, Pet Friendly, Gated Communit, Two Master Suites, King Bed, Soaking Tub, Washer/Dryer, Fully Equipped Kitchen, Free Wireless Internet, Expanded Cable, Close to Disney. Pool, Spa, Three Sun Loungers, Table, Four Chairs, Shaded Lanai, Lake View, Southern Exposure. A Disney entrance is only 5.9 miles away. Sea World, Universal, and the Convention Center are approx. 15 minutes beyond that. Excelente opcion, bien equipada, muy atentos y muy limpio. Gracias por dejarnos hospedar en su casa, todo estuvo excelente! Amazing place! Location could not have been any better. Convenient to everything! We were here for an event at the Gaylord and travel back and forth was perfect! Disney was maybe 15 minutes to the main gate. The home was clean and had all the basics we needed. Very spacious. Beds were super comfortable. Pool area was wonderful. The hot tub was perfect after a long day. My only concern (and this is beyond the control of Lance) is the parking. The neighborhood is very picky about the driveway. It is just big enough to fit 2 vehicles and you better not go over the sidewalk even an inch or youll get a knock on the door by security. And absolutely no street parking!! Luckily we were ok, and if needed the garage is big enough to fit 2 cars. Will be back next year at this time and plan on renting again! Well, this is our 3rd or 4th time renting from you and we were as happy this time around as we were the first time. We love getting away to Florida for some rest and relaxation and thanks to the lovely home we rented and your awesome service we were able to do just that, get some R&R. Well be back to FL real soon and you better believe it were going back to Florida Dream Homes for our vacation rental needs! Thanks for always making our stays awesome.....see you again soon! Great host. Very responsive with a dynamic team. Brandon went above and beyond to make sure we were comfortable. Fantastic location. Close to everything. Huge comfortable house, you will feel at home here. Beautiful, spacious home. Perfect vacation place! Tks!